Happy Friday everyone! Our break starts tomorrow onwards for a week to celebrate the Chinese New Year! darling daughter is done with her exams and my son is writing his last exam of the semester, so kiddos are surely relieved. High school brings in the unseen pressure of exams I guess. I am finally revealing the published card today, as the magazine is out, and this card can now see the light on my blog. I used velvet rose distress ink to sponge the stripes, the heart was traced using a die cut, and then pierced and stitched the pink sequins. added brown glitter paper on the white stripes, and a few pearls. the panel was framed with a shimmery maroon card base and added to the white base. That is it. Oh yes, the sentiment is from Technique Tuesday - home is. There's the gorgeous stitching again! And this time with sequins! So beautiful! 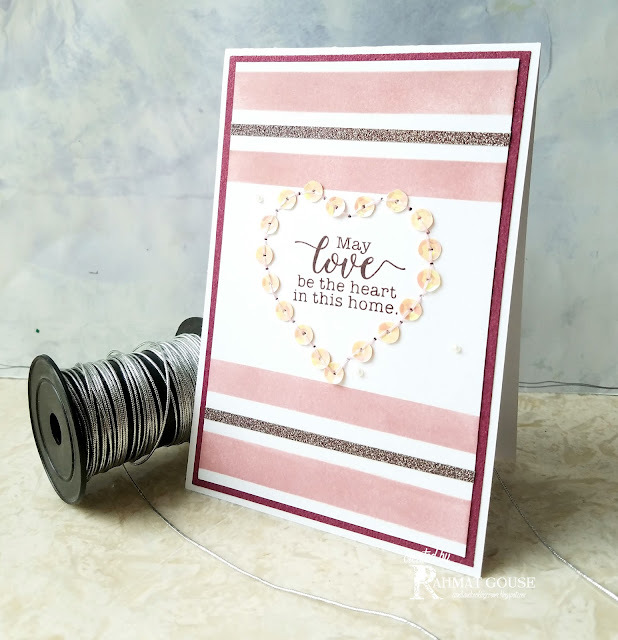 I love the stripes too - perfect to define the focus for the sequined heart! One of my favorites from you, Rahmat! Lovely card Rahmat. that heart--swoon! Thank you for sharing at Inspired by All the Little Things! Now this is such a brilliant design! I've never seen people using the sequins in this way and I absolutely LOVE it!! So pretty! Congrats, Rahmat - love this sweet design and lovely sentiment! Thanks for sharing it with us at the Simon Says Stamp Wednesday challenge! Very pretty CAS card! 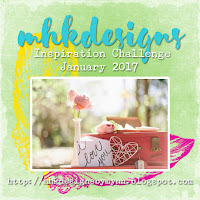 Thanks for sharing with us at MHKDesigns! WOWZER! Totally loving your stitched sequin heart. What a brilliant idea. LOVE it. Thank you so much for playing along with MHKD and we hope to see more lovely projects from you. Gorgeous take on the inspiration photo! Thanks so much for playing along with us at Inspired By All The Little Things! Rahmat, you are a very interesting sketch used! Thank you for participating in the task of Sovushka Slavia! Beautiful card! Thank you of Sovushka Slavia!